Gong Xi Fa Cai, people!!! The first Japanese restaurant in KL which allows you to customize you own maki, mix and match it as you like; in your way. Using the urban Japanese cooking methonds and techniques to bring out the flavour of the ingredients; promising to give an extraordinary dining experience to the patrons. I am attracted to their customizing concept in the maki/ sushi roll. 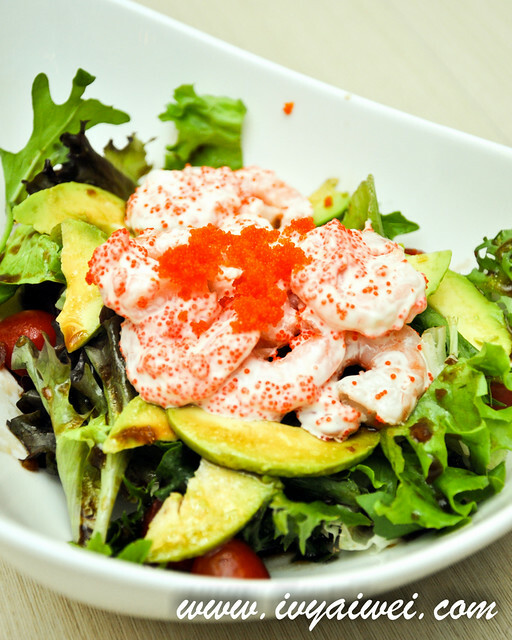 Succulent prawns and sliced avocados with tobiko. 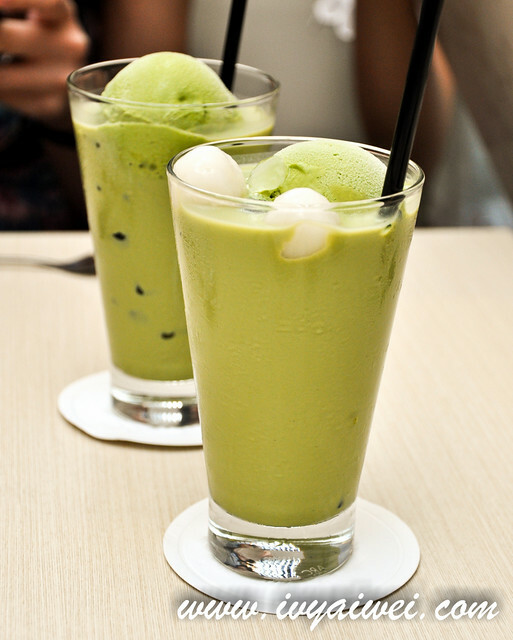 Love the fresh combination. 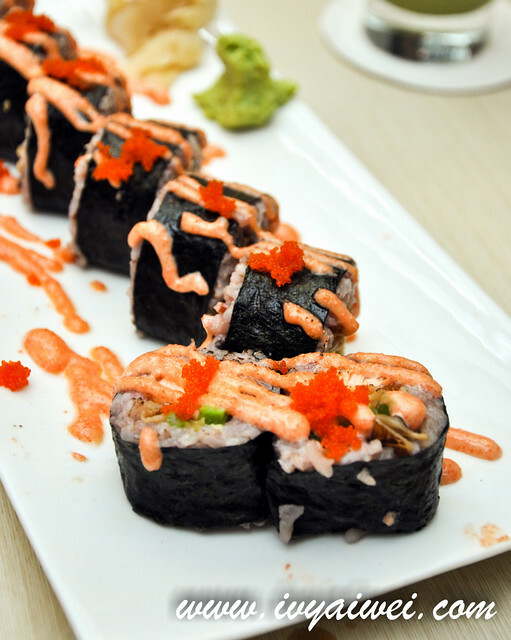 Here in OKONOMI, you are allowed to customize your sushi roll/ maki. The customizing steps are pretty fun and interesting! Firstly, choose your rice base in between white or brown rice and seaweed wrap or soy wrap. Then, choose the maki size. 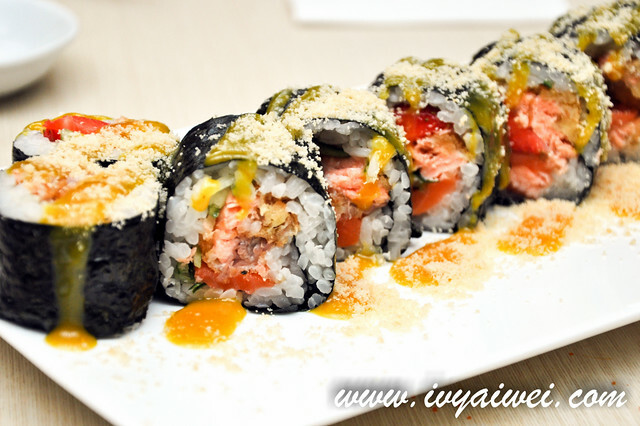 The 6-piece small roll (Rm 13.9) comes with 3 regular fillings, 1 toppings and 1 sauce. 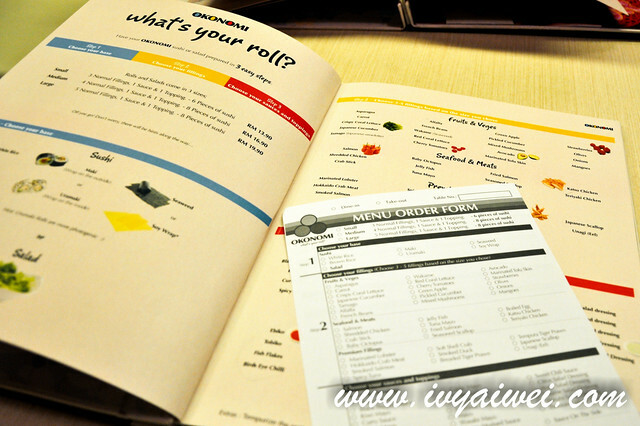 The 8-piece medium roll (Rm 16.9) and large roll (Rm 19.9) comes with 4 or 5 regular fillings respectively. Top up Rm 5 for premium fillings such as scallops and unagi. It was super fun customizing your own unique rolls and flavours by just choosing the ingredients. There are a variety of fillings, toppings, and sauces for you to choose from. Mix and match them in any way you like and any way can be possible. Maybe you will come out with some interesting combination. 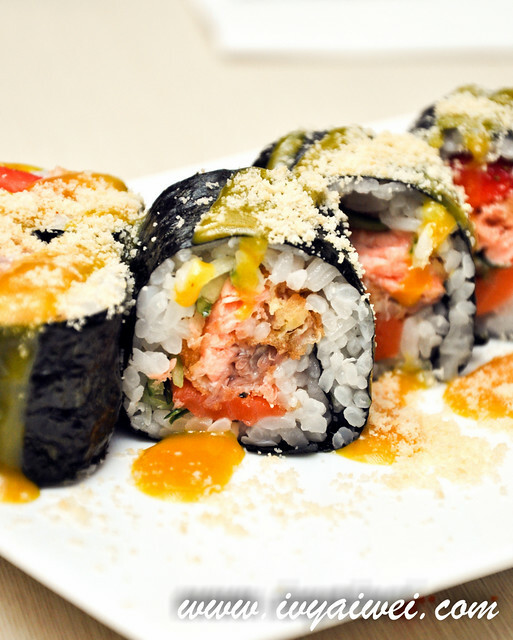 If you are not too sure how to do it or afraid your maki will turn out weird, there are also house rolls on the menu. We chose the medium rolls that come with 4 fillings. The birthday bff went for the safer combination. Brown rice with seaweed. 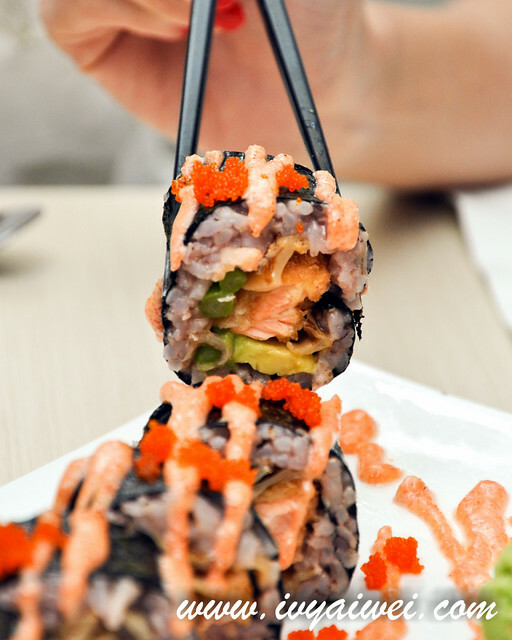 Asparagus, avocado, fried salmon and seasoned scallop; topped with tobiko and dressed with spicy mentai mayo. As for mine, I went a bit adventurous. White rice with seaweed, Japanese cucumber, strawberries, salmon, fried salmon; topped with parmesan cheese and dressed with honey mustard sauce. I find my combination interesting but the birthday bff said it was weird. LOL. I must say the honey mustard sauce was a little overly sweet to go with my fresh sweet base. Scallops, prawns, crabmeat and potatoes tossed in zesty garlic and olive oil sauce; topped with bird’s eye chillies. 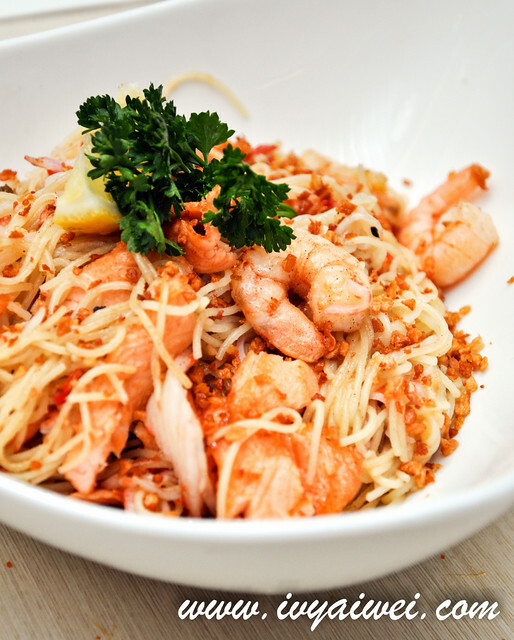 The pasta was really fragrant with the garlic flavours but then it was done way too spicy. Spicy dao all the tears coming out. 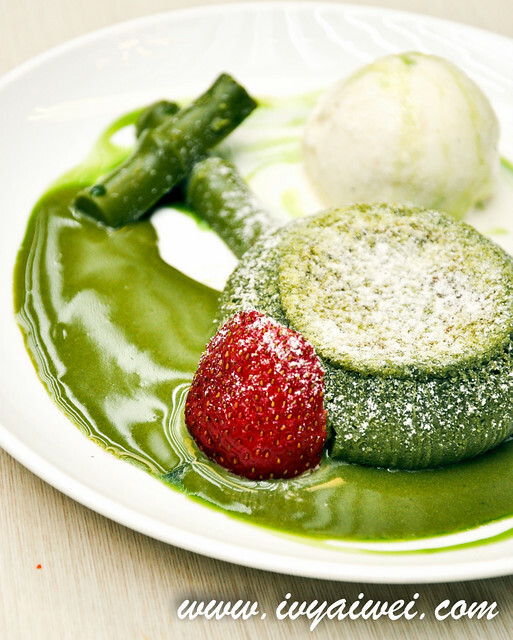 Matcha white chocolate cake filled with delicious matcha chocolate molten lava served with vanilla ice cream, matcha chocolate sticks and fresh strawberries drizzled with powdered sugar. I put a very high expectation on this lava cake. 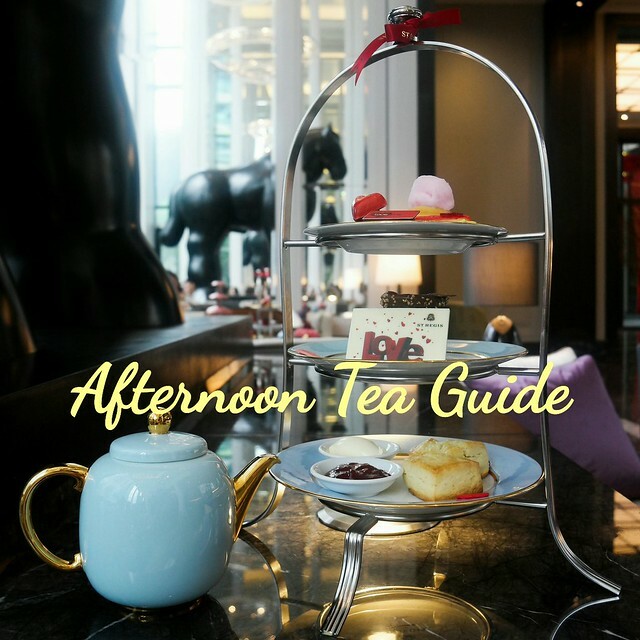 As I have gone through a lot of reviews, many said it was amazingly great and yummy. But then… it didn’t really wow us. Ours was served with the gooey matcha lava already leaked out from the cake. 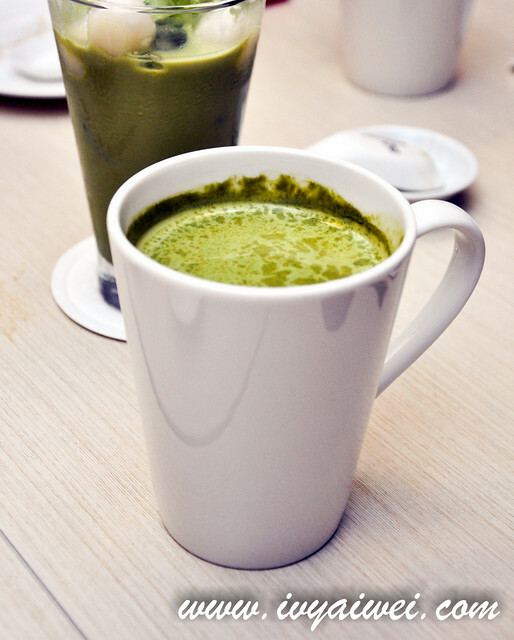 And we found that it was on the sweeter side and matcha flavour didn’t really boost out. I wonder what is soy wrap?